The 2015 Forcht Bank King of the Bluegrass Championship was a classic battle between undefeated opponents in Brentwood Academy (10-0) and No. 10 Trinity (9-1). 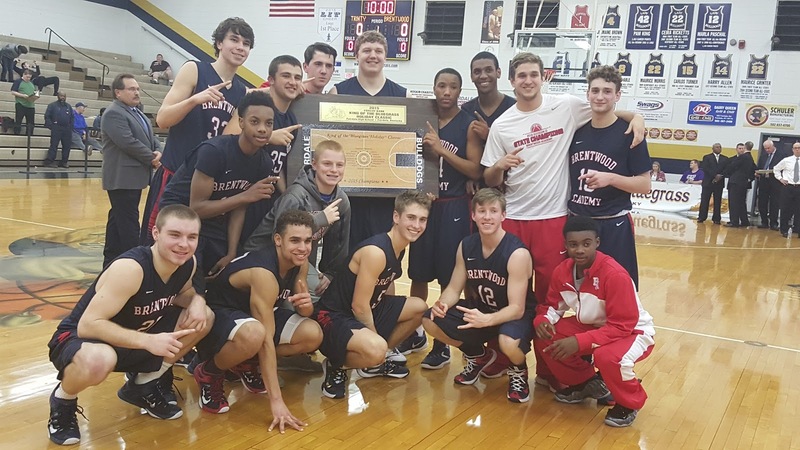 The game provided plenty of spicy matchups and the teams battled to 10 lead changes before the Eagles of Brentwood Academy claimed the King of the Bluegrass title in their first tournament appearance. The win extended the Eagles overall winning streak to 20 games. Brentwood Academy got off to a quick start behind 2015 State Tournament MVP Jeremiah Oatsvall who scored the first seven points for the Eagles to take a 7-3 lead. Junior LJ Harris jumped started things for Trinity scoring four big points to help the Shamrocks pull back to tie the game at 7-7. The teams combined to shoot five three-point field goals over the final three minutes of the opening quarter with Lukas Burkman's three-pointer giving Trinity an 18-16 lead at the end of the period. The Shamrocks lead grew to five points early in the second quarter. A basket by Jeremiah Oatsvall midway through the second quarter put the Eagles back in the lead 24-23. Trinity got eight straight points from junior Jacob King to extend their lead back to five points. Oatsvall closed the half with an old fashion three-point play to cut the Shamrocks lead to 31-29 at the half. The two teams exchanged buckets early in the second half before a Parker Suedekum three-pointer pulled the Eagles back within 37-36. Trinity halted the Eagles progress with an 8-0 run midway through the third quarter to extend their lead to a game-high eight points. Brentwood Academy found their own momentum during a 9-2 run to pull within 47-46 in the final minute of the third quarter. The streaks continued with Trinity piecing together a 7-2 run in the opening minute of the fourth quarter to take a 56-48 lead. Eagles' sophomore Darius Garland single-handedly scored the next eight points for Brentwood Academy to tie the game for the first time in the second half at 56-56 with 4:52 remaining. Two trips later Darius Garland put the Eagles back in front 61-60 with his fifth three-point field goal of the game. Jacob King put Trinity back in the lead less than a minute later with a pair of free throws. Tyler McNair's basket on the ensuing possession gave Brentwood Academy the lead for good. Darius Garland's block on the defensive end gave the Eagles the ball back for Parker Suedekum to push the lead to 65-62 with a pair of free throws. LJ Harris gave the Shamrocks a last bit of hope with a putback with 27.4 remaining in the game. Darius Garland scored on the Eagles next possession with an assist from Cam Johnson to give Brentwood Academy a 69-64 lead. The Shamrocks missed their fourth straight three-point attempt on their next possession and Parker Suedekum's basket in the closing seconds sealed the 71-64 victory for the Eagles. Trinity was led by All-Tournament Team selection Jacob King with 22 points and teammate LJ Harris added 14 points and 7 rebounds. Gabe Schmitt, another All-Tournament Team selection, added 9 points for the Shamrocks. 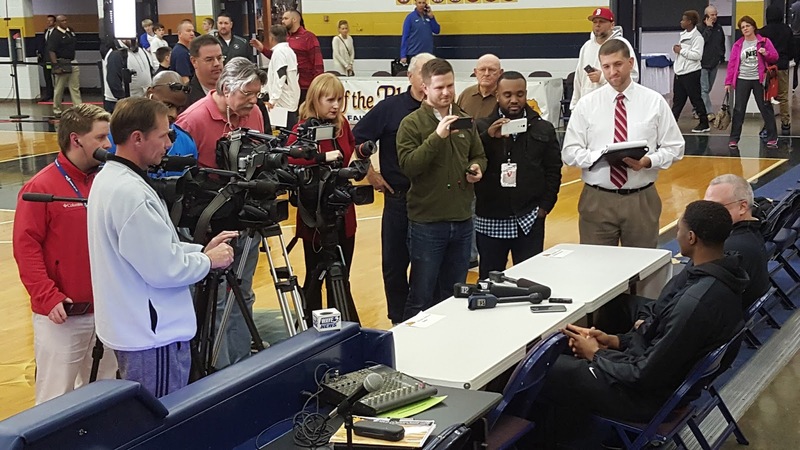 Brentwood Academy was led by Bob White MVP Darius Garland with a game-high 23 points, 4 assists and 4 steals. All-Tournament Team selections Jeremiah Oatsvall and Garrett Suedekum added 19 points and 8 points respectively for the Eagles. Tyler Sharpe 7-14 12-13 29; Jared Farris 8-11 0-0 16; Bailey Rakes 2-4 1-2 6; Connor Polson 2-2 2-2 6; Brandon Klefot 2-5 0-0 4; Austin Zurschmeide 1-1 0-0 3; Luke Ezell 0-0 0-0 0; Connor Green 0-1 0-0 0; Jared Osborne 0-0 0-0 0; Garrett Ezell 0-0 0-0 0; Garrett Wilson 0-3 0-0 0; Totals 22-41 15-17 64. Tony Jackson 8-22 4-5 23; Brandon Maxwell 5-9 1-2 11; Kamrin Boone 5-10 0-0 10; Andre Harris 1-1 3-5 6; Gavin Root 1-6 0-1 2; Parker McDonald 1-2 0-0 2; Will Alexander 0-2 0-2 0; Jeris Simmons 0-0 0-0 0; Javonnie Dixon 0-0 0-0 0; James Pitre 0-0 0-0 0; Totals 21-52 8-15 54. 3-point goals-Bullitt East 5-15 (Tyler Sharpe 3-8; Bailey Rakes 1-2; Austin Zurschmeide 1-1; Connor Green 0-1; Garrett Wilson 0-3) , North Hardin 4-23 (Tony Jackson 3-15; Andre Harris 1-1; Gavin Root 0-3; Parker McDonald 0-1; Brandon Maxwell 0-1; Kamrin Boone 0-2) . Fouled out--Bullitt East-None, North Hardin-Parker McDonald. Rebounds-Bullitt East 27 (Connor Polson 7) , North Hardin 29 (Brandon Maxwell 9) . Assists-Bullitt East 15 (Tyler Sharpe 5) , North Hardin 10 (Kamrin Boone 3) . 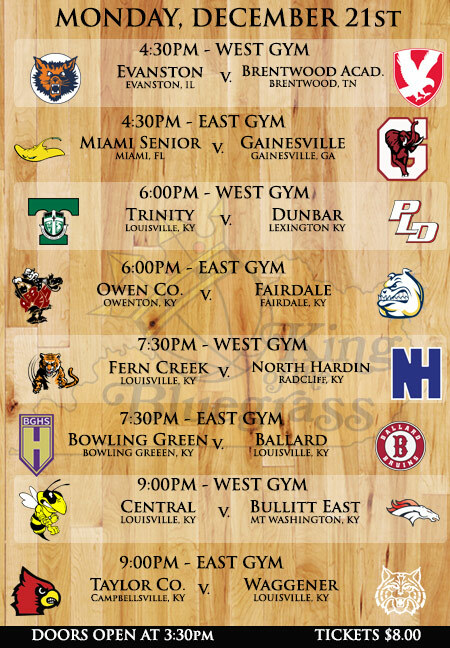 Total Fouls-Bullitt East 15, North Hardin 15. Taveion Hollingsworth 8-15 14-16 32; Darius Williams 7-14 5-7 19; Vince Clark 4-6 1-2 10; Jordan Lewis 4-9 0-0 8; Jared Gadd 1-1 0-0 2; Justin Kelley 0-2 1-2 1; Dontell Brown 0-0 0-0 0; Jordan Brown 0-1 0-0 0; Tre Homer 0-0 0-0 0; Kaelin Whiteside 0-0 0-0 0; Totals 24-48 21-27 72. Jerome Bynum 5-10 2-2 15; Nojel Eastern 4-12 3-3 11; Chris Hamil 3-4 4-4 11; Malik Jenkins 3-3 3-4 9; Dylan Mulvihill 3-5 2-4 8; Micquel Roseman 3-5 0-0 7; Trevon Marshall 2-5 1-2 6; Elyjah Williams 3-6 0-1 6; Dravon Clayborn 0-1 0-0 0; Charlie Maxwell 0-1 0-0 0; Totals 26-52 15-20 73. 3-point goals-Dunbar 3-10 (Taveion Hollingsworth 2-5; Vince Clark 1-2; Jordan Lewis 0-1; Darius Williams 0-2) , Evanston 6-16 (Jerome Bynum 3-7; Micquel Roseman 1-2; Trevon Marshall 1-3; Chris Hamil 1-1; Nojel Eastern 0-3) . Fouled out--Dunbar-Justin Kelley, Evanston-None. Rebounds-Dunbar 25 (Jordan Lewis 4; Dontell Brown 4; Taveion Hollingsworth 4; Justin Kelley 4) , Evanston 30 (Nojel Eastern 7; Elyjah Williams 7) . Assists-Dunbar 4 (Jordan Lewis 2; Darius Williams 2) , Evanston 10 (Dylan Mulvihill 3) . Total Fouls-Dunbar 20, Evanston 19. Carson Williams 10-13 5-8 25; Chad McDonald 3-9 0-0 9; Michael Dunaway 2-5 2-2 7; Vince Toftness 2-13 0-0 6; Nolan Tackett 0-2 2-2 2; Blaine Forsee 1-1 0-0 2; Josh Spaulding 0-0 0-0 0; Patrick Osborne 0-0 0-0 0; Cameron McAnally 0-0 0-0 0; Totals 18-43 9-12 51. Jamil Wilson 8-16 5-6 21; Clivonte Patterson 6-14 3-7 15; Brian Alvey 3-10 3-5 10; Antoine Darby 3-4 0-1 7; Ryan Maina 2-3 0-0 5; Dorion Tisby 1-1 0-0 2; Delonta Wimberly 1-5 0-0 2; Jake Ramsey 1-4 0-0 2; Tyrese Duncan 0-0 0-0 0; Omardrick Douglas 0-0 0-0 0; Adontis Haskins 0-0 0-0 0; Cameron Snider 0-0 0-0 0; Marchon Ford 0-0 0-0 0; Kereion Douglas 0-0 0-0 0; Tyron Duncan 0-0 0-0 0; Totals 25-57 11-19 64. 3-point goals-Owen County 6-18 (Chad McDonald 3-9; Vince Toftness 2-7; Michael Dunaway 1-1; Nolan Tackett 0-1) , Ballard 3-13 (Brian Alvey 1-4; Antoine Darby 1-1; Ryan Maina 1-2; Clivonte Patterson 0-1; Delonta Wimberly 0-1; Jamil Wilson 0-3; Jake Ramsey 0-1) . Fouled out--Owen County-None, Ballard-None. Rebounds-Owen County 34 (Carson Williams 12) , Ballard 31 (Clivonte Patterson 9) . Assists-Owen County 14 (Chad McDonald 5) , Ballard 9 (Jamil Wilson 4) . Total Fouls-Owen County 19, Ballard 16. 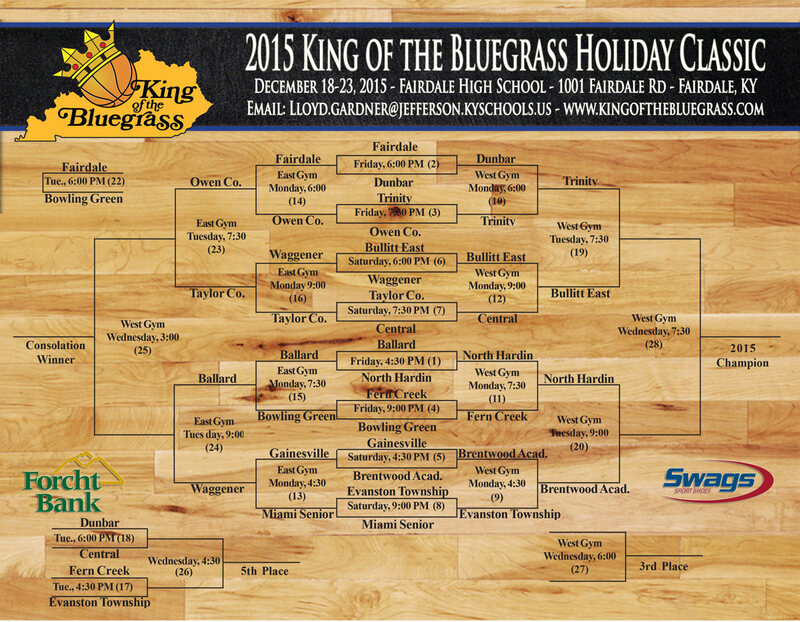 The second semifinal of the 2015 Forcht Bank King of the Bluegrass Holiday Classic matched No. 18 North Hardin (8-2) and Brentwood Academy (9-0). An exciting first quarter of action saw the teams exchange the lead on four different occasions. A Bryce Mathews putback with 1:50 remaining in the first quarter tied the game for the fourth time at 12-12. Cam Johnson put the Eagles ahead with a free throw on their next possession. Brentwood Academy took a 15-12 lead at the end of the first quarter. A 9-2 run to open the second quarter of play kept the Eagles firmly in control at 24-14. Brandon Maxwell got on a roll for North Hardin midway through the second quarter scoring five points to cut the Brentwood Academy lead to 24-21. The Eagles fought back soaring ahead to a 32-22 halftime lead. An old fashion 3-point play by Tony Jackson capped a 7-0 North Hardin run to open the second half and pull the Trojans within 32-29. The Eagles recouped though extending their lead back to nine points on two separate occasions. A Gavin Root three-pointer in the closing minutes of the third quarter gave the Trojans hope trailing just 42-40. A four point lead a the quarter break quickly grew to twelve points less than three minutes into the second half. North Hardin could not get any closer than eight points until the final minute of play. A three-pointer by Gavin Root with 42 seconds remaining cut the Brentwood Academy lead to 61-53. The Eagles missed one-of-two free throws on the next possession and a pair of long-range jumpers by Tre Peterson had North Hardin trailing just 63-59 but with only 5 seconds remaining. Cam Johnson closed out the game with a free throw in the final seconds to send Brentwood Academy to their first King of the Bluegrass final in school history. Brentwood Academy was led by Jeremiah Oatsvall with a game-high 23 points. Standout Sophomore Darius Garland added 16 points for the Eagles. Brandon Maxwell led North Hardin in scoring with 15 points and Tony Jackson added 14 points and 7 rebounds. 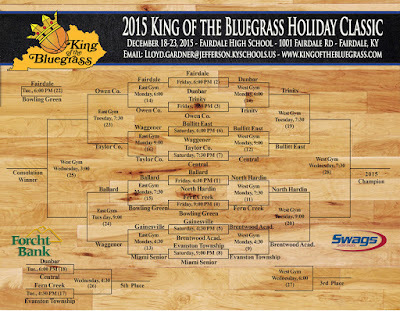 The first semifinal of the 2015 Forcht Bank King of the Bluegrass Holiday Classic it was a battle on unbeatens with No. 10 Trinity (9-0) taking on No. 8 Bullitt East (8-1). The game certainly lived up to its expectations with the two teams battling to the final buzzer. A tight first opening quarter of play saw the teams battle to a pair of lead changes and ties over the first three minutes of play. A Bailey Rakes steal and Brandon Klefot basket gave Bullitt East the early lead at 11-9 with 2:56 remaining in the opening quarter. The combination of Jacob King and Christian Terry gave the Shamrocks a 14-13 lead to end the first quarter of play. Jacob King scored the first six points of the second quarter for Trinity as the Rocks struggled to pull away from the Chargers. A basket by LJ Harris three minutes into the quarter kept Trinity ahead 22-21. A three-point field goal by Gabe Schmitt with three minutes remaining in the half jump started a 9-2 Trinity run with the Rocks taking a 34-27 lead into the locker room. Bullitt East opened the second half on an 8-2 run to cut the Trinity lead to 36-35 with 5:47 remaining in the quarter. The Shamrocks got six points from Jacob King as they reeled off nine straight to jump back ahead 44-35. A Tyler Sharpe bucket with 1:17 remaining in the third quarter capped an 11-2 Charger run that tied the game at 46-46. Jacob King kept the Shamrocks on top 49-46 at the quarter break with three-pointer at the buzzer. The first four minutes of the final period featured four different lead changes. Gabe Schmitt's three-pointer with 3:39 remaining put Trinity ahead 58-57. The Chargers cut the lead to two points on two different occasions before Tyler Sharpe's three-pointer with 7.4 seconds remaining cut the Trinity lead to 67-66. Jacob King connected on a pair of free throws for the Shamrocks to hold their lead at 69-66. A last second three-point attempt by Bailey Rakes rimmed out for the Chargers and sent Trinity to the finals for the fourth time in school history. Trinity was led by Jacob King with a game-high 27 points including four 3-point field goals. Gabe Schmitt added 20 points for the Shamrocks. Tyler Sharpe connected on five 3-pointers for part of his 26 points to lead Bullitt East. Jared Farris added 15 points and 13 rebounds for the Chargers. Game summaries will be posted for the semifinal games this evening. The final quarterfinal game of the 2015 Forcht Bank King of the Bluegrass featured No. 8 Bullitt East (8-0) No. 13 Central (4-3). A nail-biting first two minutes featured eight lead changes and a pair of ties. Jarred Farris scored on six of nine points for Bullitt East as they pieced together a 9-2 run to take a 16-10 lead three minutes into play. A Derron Douglas 3-pointer with 1:11 remaining in the opening quarter cut the lead to 20-16. The Chargers added a pair of Tyler Sharpe free throws to take a 22-16 break at the end of the quarter. The Yellowjacket held the lead steady at six points for the first two minutes of the second quarter before Bullitt East exploded. The Chargers galloped to a 38-22 lead just three minutes later in a flurry that featured eight points by Tyler Sharpe. The Yellowjackets couldn't get any closer missing their final four field goals to go into halftime trailing 39-23. Five straight points by Centrals Devin Firman capped a 9-3 Central run to cut the lead to 42-32 two minutes into the second half. Jarred Farris added four of the Chargers next six points to extend their lead back to sixteen points. Central rebounded with their own 10-1 run over the next four minutes to cut the lead to 49-42. The Yellowjackets never got any closer. Bullitt East closed out the third quarter with a 55-44 lead. The Chargers lead grew to a game-high 16 points with 7:14 remaining following a Garrett Wilson three-pointer. Central didn't cut the lead to inside double digits until a Brandon Wells three-pointer with five seconds remaining in play. Bullitt East advanced to their fourth semifinal in tournament history with an 82-73 win. Bullitt East's Tyler Sharpe led all scorers with 31 points and Jared Farris added 13 points for the Chargers. Central was led by Brandon Wells with 22 points and Davon Thompson with 15 points. Our third quarterfinal of the evening matched No. 18 North Hardin (8-1) and No. 16 Fern Creek (6-3). The two teams exchanged baskets through the first four minutes of play battling to a 6-6 tie. North Hardin flexed their muscles in the final three minutes of the quarter exploding on a 12-5 run to take an 18-13 lead into the quarter break. Fern Creek opened the quarter with a pair of free throws by DaiQuan Jones to cut the lead to three points before the Trojans took over. A 14-2 run by North Hardin put the Trojans firmly in charge with a 32-17 lead with 2:42 remaining in the half. 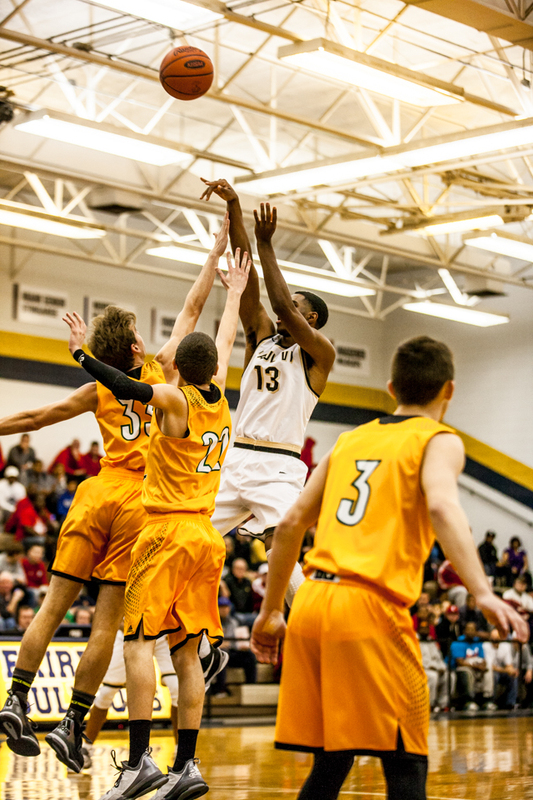 The Tigers wouldn't go away without a fight though converting seven North Hardin turnovers into nine points and cutting the lead to 33-29 at halftime. A pair of free throw by Will Alexander two minutes into the second half capped a 8-1 run by North Hardin to push their lead back to double digits at 41-30. An Ahmad Price putback at the end of the third quarter capped a 14-3 run by Fern Creek to tie the game at 46-46 going into the final quarter. Midway through the fourth quarter the teams were still knotted at 48-48 when North Hardin pieced together a seven point. Tony Washington's field goal with 52 seconds remaining cut the North Hardin lead 55-52. Brandon Maxwell quickly converted on the other end for North Hardin to extend the lead back to 57-52. Anthony Wales kept the Tigers in the game with a basket with 29 seconds remaining. Will Alexander made one-of-two free throws for the Trojans with 19 seconds remaining to extend the North Hardin lead to 58-54. A turnover by each squad gave the Tigers the ball back with 15 seconds remaining but they turned the ball over on their possession. A pair of free throws Gavin Root sealed the North Hardin victory 60-54 and sent the Trojans to the semifinals for the first time since 2001. North Hardin was led by Tony Jackson with 21 points and 13 rebounds. Brandon Maxwell added 16 points and Will Alexander added 13 points for the Trojans. DaiQuan Jones added 12 points and Anthony Wales tallied 10 points for Fern Creek. In the second quarterfinal of the evening it was No.10 Trinity (8-0) taking on No. 3 Dunbar (7-1). The Bulldogs got off to a fast start in the top 10 matchup taking an early 7-0 lead. A three-pointer by Jacob King pulled Trinity within two points less than a minute later. By the mid-quarter mark the Shamrocks had tied taken the lead 11-10. The teams exchanged the lead four times over the next two minutes with Dunbar eventually taking a 15-13 lead at the end of the first quarter. The teams stayed even for the first two minutes of the second quarter before Trinity exploded hitting six three-pointers on a 26-8 run to end the quarter. Trinity held a 45-27 lead at halftime. The Bulldogs slowly chipped away at the Trinity lead in the third quarter cutting the gap to 54-44 with three minutes to play in the quarter. A late surge by the Shamrocks gave them a 62-47 cushion entering the final period. The Bulldogs put together a 5-0 run midway through the final quarter but could not get any closer than 10 points. Gabe Schmitt scored eight points in the final three minutes for the Shamrocks to seal the 81-70 victory and send Trinity to the semifinals for the fourth time in tournament history. Trinity was led by Gabe Schmitt with 22 points. Jacob King and LJ Harris added 18 points and 12 point respectively for the Shamrocks. Darius Williams led Dunbar with a game-high 26 points and Taveion Hollingsworth added 11. In the first quarterfinal of tournament action it was Brentwood Academy (8-0) taking on out-of-state foe Evanston (8-2). A early run by Evanston have the Wildkits a 7-2 lead to open play. Turnovers haunted them toward the end of the first quarter as the Eagles converted 6 Wildkit turnovers into 7 points to pull ahead 10-9 at the end of the opening quarter. Evanston used a 5-0 run to open take the lead 14-10 early in the second quarter. A Tate Pierson 3-pointer tied the game a 14-14 less than a minute later but Evanston's defensive pressure was too much for the Eagles with the Wildkits ending the quarter on a 13-5 run to take a 27-19 lead into the locker room. Brentwood Academy the second half on a 11-2 run to take the lead at 30-29 with 4:13 remaining in the third quarter. The teams exchanged the lead twice before a 6-0 run by the Eagles gave them a 40-34 lead going into the final quarter. Nojel Eastern's basket less than a minute into the fourth quarter pulled Evanston back to within 40-38. A pair of spurts by both teams saw Evanston cut the lead back to to one possession on three different occasions but they couldn't get any closer. Brentwood Academy closed the game on a 15-7 run to advance to the semi-finals with a 60-49 victory. Brentwood Academy as led by Darius Garland's 19 points and Jeremiah Oatsvall added 12 points. Evanston was led by Nojel Eastern's 16 points and 11 points from Dylan Mulvihill. 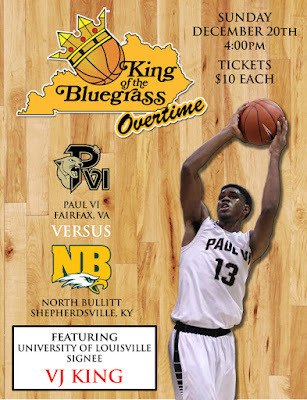 Today's action in the Forcht Bank King of the Bluegrass Overtime matched Paul VI (5-2) of Fairfax, VA and North Bullitt (7-1). It was the out-of-state Panthers that got out to a hot start with a slam dunk by Brandon Slater. Jared Free kept things close in the opening minutes with an early three-pointer to close the lead to one point. A second Brandon Slater dunk propelled an 8-1 run by Paul VI that gave them a 12-4 lead. By the end of the first quarter the Panthers had converted 10 North Bullitt turnovers into 16 points and a 22-10 lead. It was stifling defense that allowed Paul VI to continue to grow their lead in the second quarter. The Panthers held the North Bullitt shooters to just 29% from the field. VJ King led the Panthers on their second quarter run scoring nine points as the Paul VI lead grew to 56-22 at halftime. In the opening four minutes of the second half the Panthers lead continued to grow reaching 47 points. The Eagles of North Bullitt put together a quick spurt to cut the lead back to 42 points following a Ryan Henson three-pointer but couldn't get any closer. Paul VI went on a 16-5 run to give them their largest lead of the game at 96-40 with 3:11 remaining in the game. It was Devon Sims basket with 2:09 remaining that put Paul VI over the century mark with a 100-45 lead. 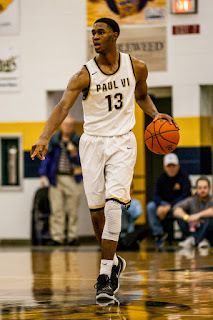 Tyler Dunnavan connected on a pair of long-range jumpers in the final minute of play to cut the final score 103-51. 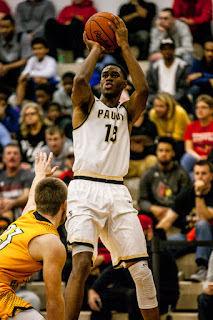 University of Louisville signee VJ King was dominant pouring in 35 points and grabbing 9 rebounds for the Panthers. 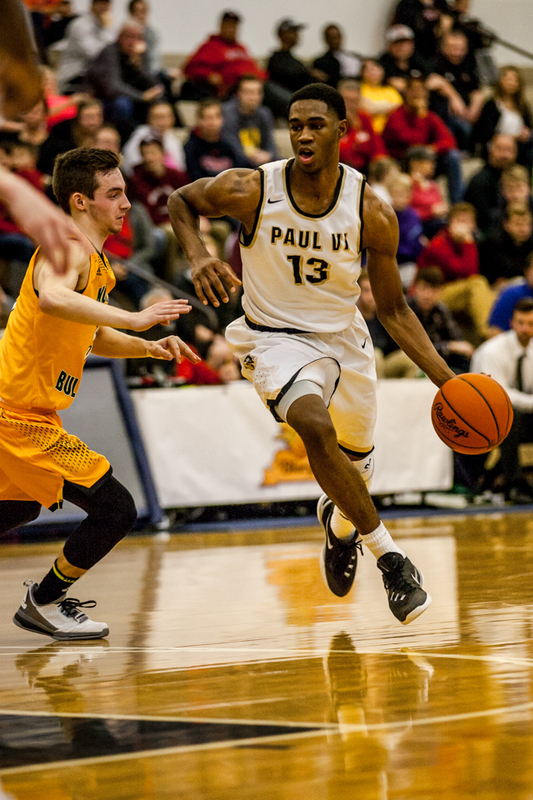 Myles Douglas added 22 points and Aaron Thompson contributed 14 points for Paul VI. The Eagles were led by Ryan Henson with 19 points including four 3-point field goals. Travis Dunnavan added 11 points for North Bullitt. 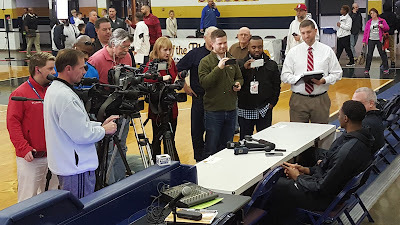 Media Gathered before today's King of the Bluegrass Overtime game to interview University of Louisville Signee VJ King and Paul VI Head Coach Glen Farello. VJ King takes a shot over two North Bullitt defenders in the King of the Bluegrass Overtime game. University of Louisville Men's Basketball Coach Rick Pitino watches Cardinal signee VJ King. 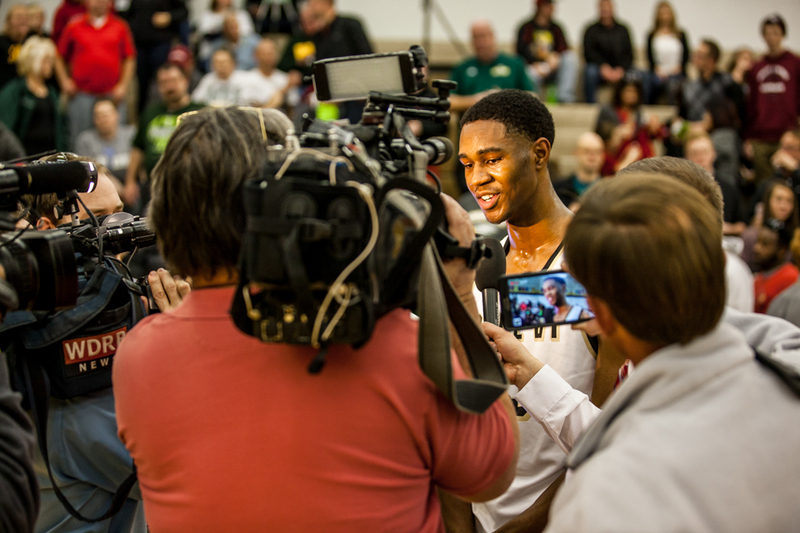 VJ King adds two of his game-high 35 points against North Bullitt. 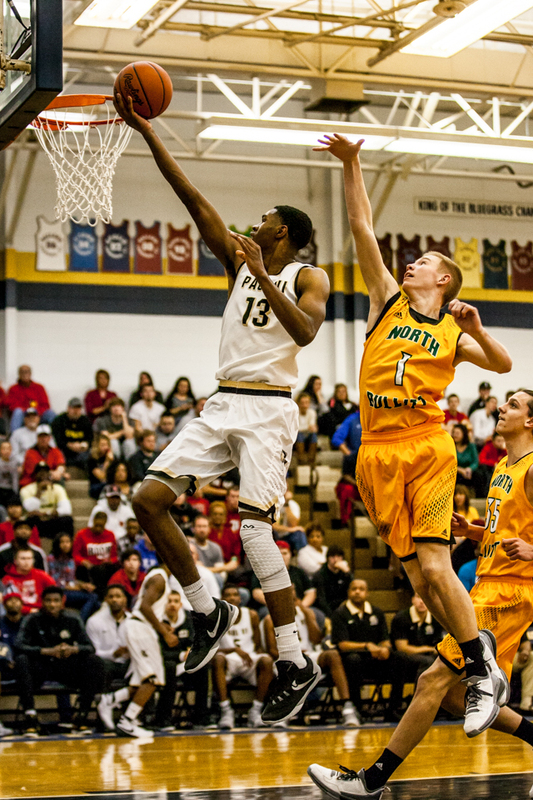 VJ King soars to the basket past North Bullitt's Lance Johnson. 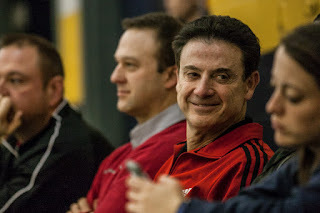 University of Louisville signee VJ King directs traffic during his team's 103-51 victory. VJ King drives past a North Bullitt defender in the second half of the King of the Bluegrass Overtime game. 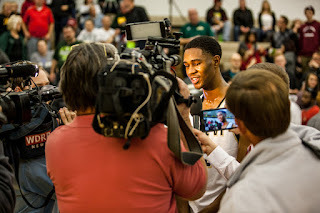 The media interviews VJ following Paul VI's victory over North Bullitt. 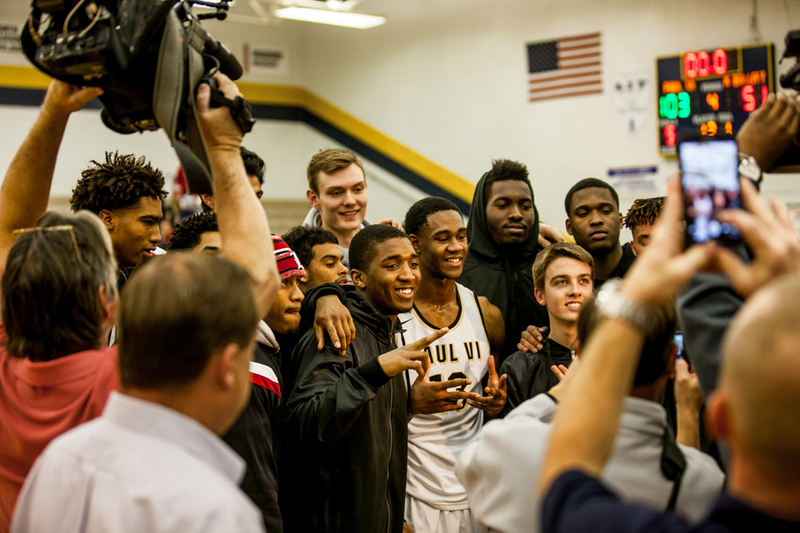 VJ King poses with future University of Louisville teammates following the game. In the nightcap it was a battle of out-of-state opponents with Evanston (8-1) taking on Miami Senior (7-5). It was Marlon Sierra who Stingarees who got on the board with a quick 5 points. A Malik Jenkins 3-pointer tied the game for the first time at 7-7. The two teams swapped the lead twice in the final four minutes of the opening quarter with Marlon Sierra's long range jumper putting Miami Senior ahead 18-16 at the end of the first quarter. Three lead changes kept things exciting in the opening minute of the second quarter with Evanston jumping out to a four point lead on two different occasions. A third 3-pointer by Marlon Sierra jump started an 8-0 run by Miami Senior who took a 38-32 lead into halftime. It was Elyjah Williams' free throw with two minutes into the second half that capped an 7-2 spurt by Evanston to pull within one point. The Wildkits could not keep the momentum in their favor though as Malcolm Nicholas Jr led Miami Senior on a 9-0 run to push their lead to 49-39. Zach Brown's basket just thirty seconds into the fourth quarter pushed the Stingarees lead to a game-high 13 points. It was the Wildkits that capitalized down the stretch on a 17-4 run to tie the game at 60-60 with just 2:22 remaining. Zach Brown made the second of two free throws to push Miami Senior back ahead 61-60. With 1:10 remaining in play Evanston's Jerome Bynum connected on a three-pointer to give the Wildkits a 63-61 lead. A foul on Bynum sent Miami Senior's Marlon Sierra to the free throw line with 51.0 seconds remaining to tie the game at 63-63. An off-balance shot by Jenkins at the buzzer sent the game to overtime. The difference in the overtime period was turnovers and free throw. Three of the first four field goals in overtime were long distance with the teams exchanging the lead. Malik Jenkins' three-pointer with 1:36 remaining in overtime gave the Wildkits the lead for good. An old fashion three-point play by Miami Senior's Marlon Sierra got the Stingarees as close as two points. Following an Evanston turnover in the final 4.8 seconds the Stinagrees had a chance but Malcolm Nicholas Jr shot fell short. Evanston will advance to the quarterfinals with the 77-75 victory. Miami Senior's Zach Brown was dominant with a game-high 33 points and 16 rebounds. Marlon Sierra added 20 points for the Stingarees. Malik Jenkins led Evanston with 22 points and Chris Hamel added 18 points. Highly touted junior Nojel Eastern added 16 points, 7 rebounds and 7 steals for the Wildkits. In the third game of the evening it was defending KOB finalist No.1 Taylor County (3-2) and No. 13 Central (4-2). The battle between the two led to 14 ties and 13 lead changes throughout. A quick three-pointer to open the game by Mr. Basketball candidate Quentin Goodin gave Taylor County the early 3-0 lead. The Cardinals lead lasted only two minutes when the lightning fast Yellowjackets went on a 9-0 spurt led by seven points from junior Devin Firman. David Sloan scored five straight for Taylor County to pull the score even at 12-12 but it was a late Central run that gave them a 21-16 lead at the quarter break. A 10-4 Taylor County run put the Cardinals back on top early in the second quarter for the first of six lead changes in the quarter. A pair of three-pointers in the final minute of the half sent Central to the locker room with a 40-38 lead. The teams exchanged baskets for the first two minutes of the half before a Derron Douglas three-pointer pushed the Central lead to 52-48. Taylor County would fight back to take the lead on a David Sloan basket with 2:38 remaining in the quarter. A 10-6 run to close the quarter sent Taylor County into the final quarter with a 63-58 lead. Domonique Gaines of Central tied the game at 65-65 less than a minute into the fourth quarter. The teams swapped the lead five times in the next two minutes. A pair of 4 point leads by each team left the game tied at 78-78 with 2:06 remaining. A pair of Devin Firman 3-pointers pushed Central ahead 86-78 with a minute remaining in the game. The Cardinals couldn't get any closer than 7 points for the remainder as Central nailed four free throws down the stretch to clinch the 90-81 upset. Junior Devin Firman led all Central scorers with 26 points including 6 three-point field goals. Brandon Wells added 16 points and Anthony Southers added 14 points. David Sloan led Taylor County with a tournament-high 42 points. 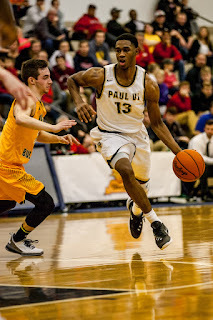 Quentin Goodin added 27 points and 14 rebounds for the Cardinals. Labels: 2015, Central, Taylor Co.
Our second matchup of the night featured sixth region favorite and 8th ranked Bullitt East (7-0) against seventh region favorite and 7th ranked Waggener (4-2). A tight opening quarter of play between the top 10 opponents saw Bullitt East take an early lead 5-0 lead. The Wildcats fought back to within a point on two different occasions but the Chargers led 17-12 at the quarter break. An 8-3 run to open the second quarter kept the Chargers in control with a 10 point lead. Waggener cut the difference to five points midway through the second quarter but could get any closer as Brandon Klefot scored the final six points for Bullitt East to give them a 36-26 lead at halftime. Waggener's Jaalam Hill scored seven of the Wildcats first ten points in the second half to pull the game even at 36-36. A pair of Kevin Kirby free throws gave the Wildcats their first lead on the next possession. Bullitt East fought back to tie the game on two different occasion before a 10-0 run to close the quarter gave the Chargers a 50-40 lead. An 8-0 run two minutes into the final quarter got Waggener back into the game cutting the lead to 54-50. The Wildcats got as close as four points on one other occasion with 1:42 remaining in play but couldn't close the deal. 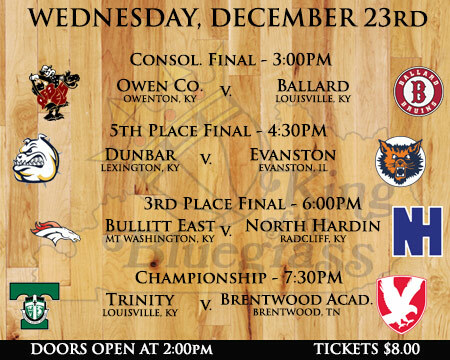 Bullitt East scored the final four points of the game to clinch their spot in the quarterfinals 67-58. Bullitt East was led by Tyler Sharpe's game-high 21 points and Bailey Rakes and Brandon Klefot added 15 points and 13 points respectively. The Wildcats were led by Isiah Knight and Nicholas Kratholm with 10 points apiece. 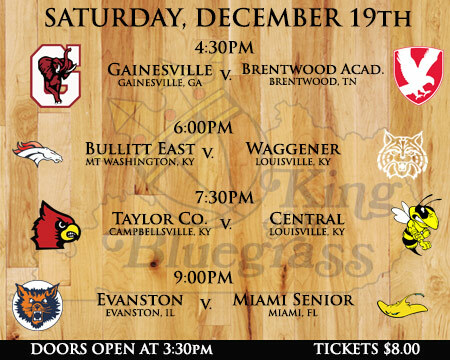 The opening matchup of the second day of King of the Bluegrass action featured out-of-state opponents Brentwood Academy (7-0) and Gainesville (6-1). The Eagles of Brentwood Academy struggled from three-point range missing four early long-range shots but used defensive pressure to take a 9-5 lead. A 5-0 run by the Red Elephants pushed Gainesville back ahead briefly before the teams swapped baskets battling to a 15-15 tie at the end of the opening quarter. The Brentwood Academy defense was too much for Gainesville to handle as the Eagles forced nine second quarter turnovers as part of a 20-5 run. A pair of late baskets by Gainesville's Bailey Minor pulled the Georgia squad back within 37-27 at halftime. Sophomore sensation Darius Garland got hot for Brentwood Academy in the third quarter hitting four three-point goals and scoring 14 points to extend the Eagles lead back to as many as 15 points at 56-41. After nearly two minutes of scoreless action the Eagles pushed ahead to a game-high 16 point lead. Kenyon Buffen scored six straight points to fuel a 12-4 run by Gainesville midway through the fourth quarter that pulled them within six points. The Eagles struggles at the free throw line hitting on 4-of-7 in the closing 2:30 of the game but Gainesville couldn't get any closer. The Eagles advanced to the quarterfinals with a final margin of victory of 69-60. Brentwood Academy sophomore Darius Garland led the Eagles with a game-high 24 points. Senior Parker Suedeum added 17 points for the Eagles. Gainesville had three scorers in double digits with Kenyon Buffen's 19 points leading the way. 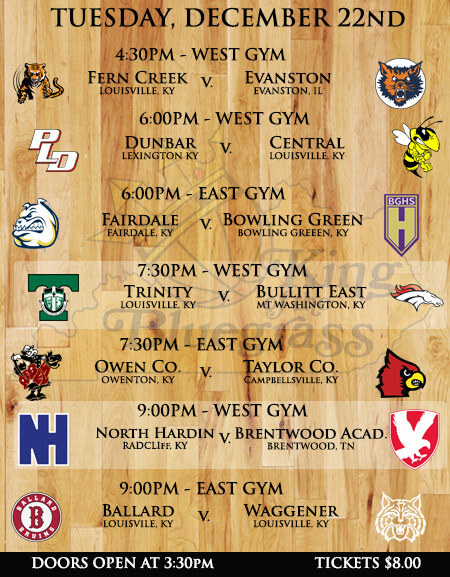 The final game of our opening night paired defending state finalist Bowling Green (6-1) and 16th ranked Fern Creek (6-2). It was the 2nd ranked Purples who jumped out to an early 8-0 lead with Fern Creek missing their first 3 field goal attempts. A Kyree Hawkins layup midway through the opening quarter pulled the Tigers back within two points. The Purples pushed ahead by five following a Collin Jackson 3-pointer but Fern Creek pulled within one to end the quarter at 16-15. The Tigers took their first lead of the game at 17-16 thirty seconds into the second quarter on a A.J. Thomas free throw. Tony Washington's basket two minutes into the quarter capped a 9-0 Tiger run giving them a 21-16 lead. A steal and layup by DaiQuan Jones gave the Tigers their largest first half lead at 30-19. A late basket by Terry Taylor pulled Bowling Green within 24-33 going into halftime. The Purples continues to cut away at the Fern Creek lead with Perry Ayers free throw pulling Bowling Green within 33-27 a minute into the second half. After both teams went scoreless for nearly two minutes of play Bowling Green pieced together a 10-2 A three-pointer by Ahmad Price was the dagger that gave the Tigers the lead less than a minute into the fourth quarter. An 11-4 Fern Creek run pushed their lead to as many as 7 points midway through the final quarter. Fern Creek closed the game with a 6-0 run to seal the final margin of victory at 59-47. Fern Creek was led by sophomore Anthony Wales with a game-high 21 points. DaiQuan Jones and Tony Washington added 11 points and 10 points respectively for the Tigers. Bowling Green was led by Terry Taylor with 12 points. In the third game of our opening night 10th ranked Trinity (7-0) met 15th ranked Owen County (8-1). The opening four minutes of play belonged to the Rebels who pushed their lead to 9-2 following a monster slam by senior Carson Williams. It didn't take the Shamrocks long to respond cutting the lead to just one following a layup by David Burton. A 5-2 run by Owen County to end the quarter pushed their lead to 14-10. A Jacob King layup two minutes into the second quarter pulled Trinity back within one point but the Shamrocks couldn't get any closer. Michael Dunaway's putback in the final minute of the half pushed the Rebels lead back to 34-26 where it would remain. The Rebels continued to roll in the opening minutes of the second half pushing their lead to 13 points with 4:58 remaining in the quarter. At that point the Shamrock rattled off 20 straight points holding Owen County scoreless for nearly nine minutes. The Rocks who took just their second lead of the game with 7:34 remaining extended that lead to as many as 7 points at 50-43. A Vince Toftness 3-pointer pulled the Rebels within 52-53 but they couldn't maintain the momentum. Gabe Schmitt scored 10 of his 19 points in the final 1:25 of play including eight straight free throws. Gabe Schmitt led all Trinity scorers with 19 points and Jacob King added 18 for the Shamrocks. Mr. Basketball candidate Carson Williams led Owen County with a game-high 24 points and 13 rebounds. In the second game of the 2015 Forcht Bank King of the Bluegrass Holiday Classic 3rd ranked Dunbar (7-0) met host Fairdale (2-5). It was the visiting Bulldogs who got off to a lighting fast start with a 13-0 lead connecting of seven of their first eight field goals. Host Fairdale could not get anything going falling behind 24-8 at the end of the first quarter. A 7-0 run by Dunbar to open the second quarter pushed their lead to 23 points. A putback by Taeveion Hollingsworth with 1:48 remaining in the half gave the Bulldogs a 43-17 lead they would take into halftime. Dunbar opened the second half on a 10-4 run to extend their lead to 33 points just three minutes into the second half. Fairdale got as close as 28 points following a Markelo Sullivan three-pointer in the closing minute of the third quarter. Fairdale put together an 8-0 run to open the fourth quarter cutting the lead to 22 points but couldn't maintain the momentum. With three minutes remaining in play Dunbar pushed their lead to a game-high 34 points following a basket by Dontell Brown. Fairdale cut the lead back to 26 points before Jared Gadd scored five straight to give Dunbar their final margin of victory 89-58. Dunbar senior Darius Williams led all scorers with 33 points. Taevion Hollings and ordan Lewis added 16 and 15 points respectively for the Bulldogs. 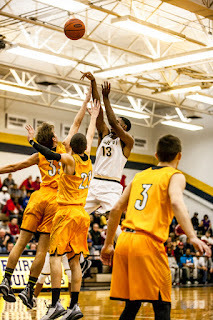 Fairdale was led in scoring by sophomore Glenn Queen with 22 points. 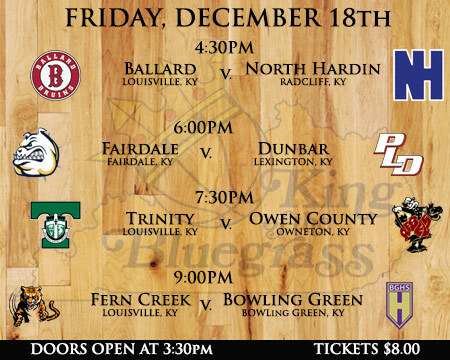 In the opening game of the 2015 Forcht Bank King of the Bluegrass it was Top 25 opponents Ballard (3-4) and North Hardin (7-1). A slow start for the Bruins, which made just 3/18 first quarter field goals, put Ballard behind 9-7 at the quarter break. A 10-4 run by Ballard in the opening half of the second quarter pushed the Bruins ahead 17-14. The Trojans couldn't get any closer with Ballard taking their largest lead of the game 21-15 at halftime. The two teams shot a combined 22.4% in the opening half. A Tony Jackson three-pointer helped North Hardin cut the Ballard lead to 21-20 three minutes into the second half. The Trojans Will Alexander tied the game at 26-26 with 1:35 remaining in the third quarter but Jamil Wilson put the Bruins back ahead 28-27 going into the fourth quarter. A putback by Tony Jackson gave the Trojans their first lead of the second half on the opening basket of the quarter. Jackson's three-pointer mid-way through the quarter pushed the North Hardin lead to 42-37. Ballard's Clivante Patterson pulled the Bruins within 42-41 with 2:40 remaining in play. Four straight free throws by the Bruins tied the game at 45-45 with just 1:17 remaining. The teams traded baskets in the final minute before North Hardin's Tony Jackson netted a floater from the lane at the buzzer to give North Hardin the 49-47 victory. North Hardin's Tony Jackson led all scorers with a double-double performance that included 24 points and 19 rebounds and 5 blocks. Brandon Maxwell added 10 points for the Trojans. Jamil Wilson led Ballard with 13 points.